Laboratoire Matière et Systèmes Complexes - Séminaire MSC. 5 novembre 2018. Christophe Raufaste (Institut de Physique de Nice) : "The superpropulsion effect with soft elastic projectiles and droplets." Accueil du site > Séminaires > Archives séminaires > Séminaires 2018 > Séminaire MSC. 5 novembre 2018. Christophe Raufaste (Institut de Physique de Nice) : "The superpropulsion effect with soft elastic projectiles and droplets.". Séminaire MSC. 5 novembre 2018. Christophe Raufaste (Institut de Physique de Nice) : "The superpropulsion effect with soft elastic projectiles and droplets." The mechanical problem of the ejection of a projectile with a catapult-like engine is not as obvious as we could initially imagine. While rigid projectiles exhibit a regular acceleration phase, the propulsion of soft elastic projectiles requires to solve the whole elastodynamics problem to account for the balance between inertia and elasticity. 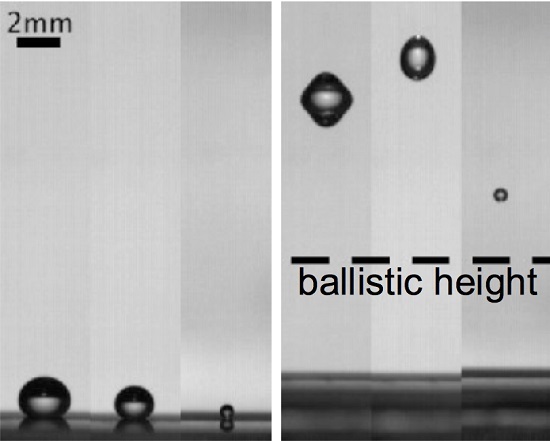 Experiments are performed with both hydrogels and droplets, which are propelled with a catapult. For the droplets, surface tension plays the role of the elastic restoring force. Data show that the ejection velocity depends on both the projectile deformation and the catapult acceleration dynamics. With a matching given by a specific value of the projectile/catapult characteristic times ratio, a 250% kinetic energy gain is obtained as compared to the propulsion of a rigid projectile. A model based on solving the wave equation for the mechanical deformation gives a very good agreement. Reference : Superpropulsion of droplets and soft elastic solids, C. Raufaste, G. Ramos Chagas, T. Darmanin, C. Claudet, F. Guittard, F. Celestini, Phys. Rev. Lett. 119, 108001 (2017).